The Amsterdam ArenA was built between 1993 and 1996. It replaced Ajax’s previous home De Meer, which, with a capacity of 19,000 seats, had become too small for the club. The Amsterdam ArenA officially opened on the 14th of August 1996 with a match between Ajax and AC Milan (0-3). The first goal in the new arena was scored by Dejan Savicevic. Total construction costs had amounted to €96 million. The Amsterdam ArenA was the first football stadium in Europe with a retractable roof. It takes about 20 minutes to open or close the roof. Shortly after the opening, it turned out that the stadium design had not accounted for good grass growing conditions, and as a result the pitch had to get renewed up to 5 times a year. These problems were later resolved with the installation of innovative grass growing technology, consisting of a combination of lamps, wind turbines, and water sprinklers. The Amsterdam ArenA counts with a total of 2,229 business seats and a further 820 seats in sky boxes. The stands are among the steepest in Europe, with the second tier having an angle of 37 degrees. In 1998, the stadium hosted the Champions League final between Real Madrid and Juventus (1-0), and in 2013 the Europa League final between Chelsea and Benfica (2-1). 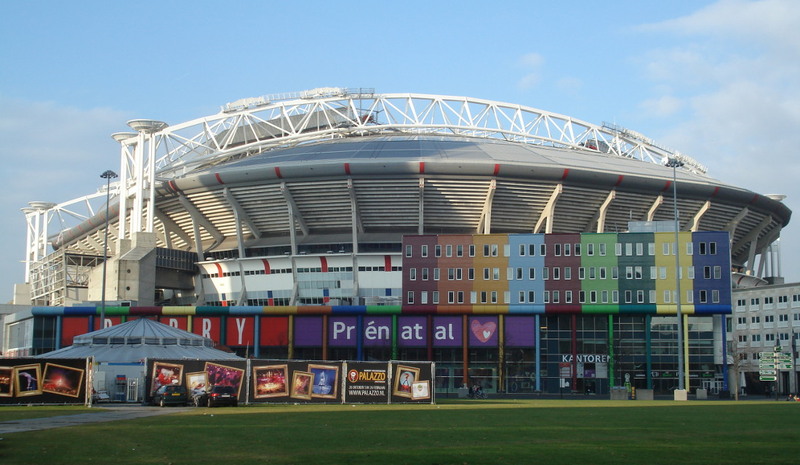 The Amsterdam ArenA was one of the playing venues of the Euro 2000 championships, hosting three group match, a quarter-final, and the semi-final between Holland and Italy (0-0). The stadium has been chosen to be one of the playing venues of the Euro 2020 tournament, which is played across different countries. For this, the stadium will be refurbished resulting in larger concourses and a new facade. The Amsterdam ArenA is located in a modern office park in the south-east of Amsterdam, approximately 10 kilometres from the city centre. The stadium is best reached by train or metro. Train station Bijlmer ArenA lies next to the stadium and can be reached in 15 minutes from Amsterdam Central Station. There is very regular service. The metro takes only little longer and stops at the same station as well as station Strandvliet/ArenA that lies on the north side of the stadium. Take metro 54 from Amsterdam Central Station, or any of the stops in Amsterdam city centre. Metro 50 connects the stadium with southern and western parts of the city (e.g. Amsterdam Zuid station). The Amsterdam ArenA is part of an entertainment and shopping complex, which includes a large cinema and two of Holland’s principal concert venues (the Ziggo Dome and Heineken Music Hall). There are also a few places to get some (fast) food or have a drink, though options remain rather limited. Recently, a few new hotels have opened near the Amsterdam ArenA, which include a Hampton by Hilton, the futuristically shaped Fletcher Hotel, and the Jaz Hotel. If arriving by car, the road-side and affordable Bastion Deluxe Hotel is a decent option, though you do need to catch a metro to get to the arena. Click here for an overview of hotels near the Amsterdam ArenA. Of course, most will prefer to stay closer to Amsterdam’s lively city centre. Tickets for Ajax games can be bought online. If tickets remain available, these can usually also be bought at the ticket windows of the Amsterdam ArenA on the day of the match. Ajax typically sell out a third of their home games. Expect to pay €25.00 for a seat behind the goal and between €30.00 and €50.00 for a seat at one of the sides for a regular match. Prices get increased for the games against Feyenoord and PSV. Ajax occasionally require possession of an Ajax Club Card to buy match tickets, but most matches go on general sale. There is a separate ticket portal for foreigners to buy tickets. The Amsterdam ArenA offers guided tours that include the press room, mixed zone, VIP areas, and dressing rooms. The tour lasts about 60 to 75 minutes and are in English and Dutch. Tours run 8 times a day from September to June and more often during the summer months. You can check the latest schedule here. The tour costs €14.50. Bookings are not required, but can be made online. Ajax.nl – Official website of AFC Ajax. Amsterdamarena.nl – Official website of the Amsterdam ArenA. Iamsterdam.com – Official website of the Amsterdam Tourist Board. GVB.nl – Amsterdam public transport information. NS.nl – Check train times and fares. One of my favourite stadiums! It stands out as it is very colourful. The tiers are very steep but it is defenietely worth a visit. Amsterdam itself is very friendly city and i would recommend it to everybody. There are hotels in the Amsterdam ArenA , e.g. the recently opened and remarkable Fletcher hotel. Another note: if you find the Amsterdam Central station area already ‘seedy’ at night I’d suggest to stay away from Amsterdam at all. It sure is a messy area because of the many construction sites (new subway line, car and bicycle tunnels, renewal of the Central station, new bus station) but it is a very safe area and not only because it’s heavily patrolled by police and security teams. We joined the World of Ajax tour in October 2011. After having checked the Amsterdam Arena website for opening times, we arrived shortly before one of the given departures. As it was a Saturday afternoon there were already a lot of participants waiting and an estimated 50 people joined our tour, which was a lot. The tour started at pitch-level with the possibility to have your photo taken by a professional photographer. No visit to the dugouts though. We then moved to the press room, where our guide held a fake press conference with some of the tour’s participants. We subsequently went up the stadium to see the view from the second tier. All the time there was ample time to take photos, and at the second tier some opportunity to walk around the stands. The guide provided background information in Dutch and in English. As the group was very large, probably too large, moving around the stadium took a lot of time, and one had to wait quite a lot. The guide was friendly, but spoke rather slowly, probably to facilitate the many non-native English speakers, but this added to a feeling of slight tedium. Possibly the guide could have provided a bit more background information, or spiced things up with some interesting facts. The tour included relatively few parts of the stadium, less than in most tours, and it certainly would have been nice to see the dugouts, players’ tunnel, or VIP boxes. And to have the dressing rooms included in the standard tour. The stadium is impressive enough to make it a decent experience, especially if your primary aim is to make photos, however the feeling remains that there is more potential than the current tour offers.